Big things are happening here at Wildbit and today brings a culmination of months of work to launch something significant. A little less than two years ago we launched dploy.io on the basic premise of “what if we shared our deployment tools with more than just Beanstalk customers?” At that point, Dima, who wrote the first lines of Beanstalk, decided to take on the project and see what he could make of it. In short time, this “project” has evolved into a mature “product” with customers who rely on it to deploy their most critical applications. It has become a huge part of Wildbit and a significant service for our community of developers and designers. Late last year, while witnessing the growth and potential, we decided that dploy.io deserved some more effort. Not just in resources, but in the toolset that it offers. We put together a plan and we’ve been heads down since. Today is the day we get to lift our heads and unveil the toolset we’ve been hustling on for months. With this launch, from “project” to “product”, we also felt it deserved a better name and brand. 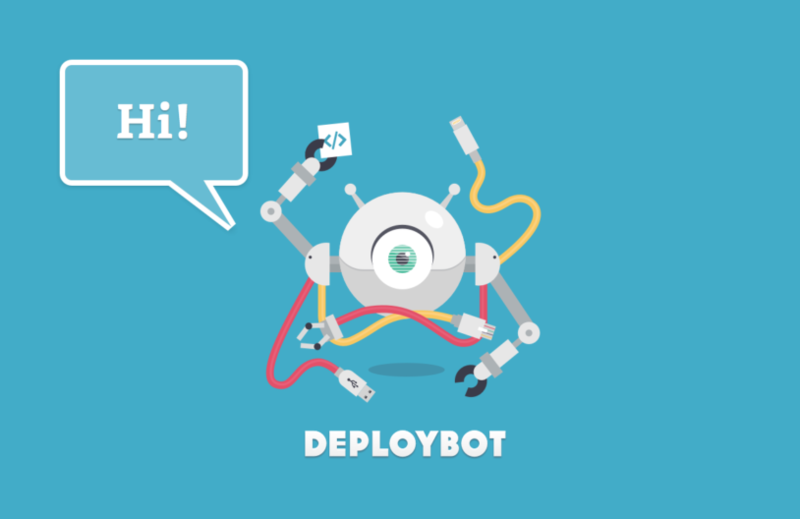 We’d like you to meet DeployBot. In the coming years this little robot will define how developers deploy web apps. It will help you get away from confusing and manual deploy scripts, hacked together permission systems for teams, and a constant unknown of who deployed what and when. You’ll know DeployBot is working when you don’t have to think about deployments anymore, they just happen on a consistent basis with little effort from your entire team. That’s our mission. To support this mission, today’s launch of DeployBot is something new. It’s not just a rename, it’s a new toolset allowing you to configure and deploy almost anything. Over the last decade, the process of web development drastically changed. Even the simplest website requires some kind of compilation or post-processing. It’s no longer just triggering hooks, running SSH commands, or moving files to a server. We could have just built a virtualization environment and kept it in the background. Instead, we’re opening up the power of Docker to your deployment process. Docker is the best way to execute your code, on our servers, with complete isolation and security. Within Build Tools, you can select a pre-defined container that we offer or you can select a container from the Docker registry. Each container gives you a wide variety of Linux distributions, pre-installed software, and almost any configuration you desire. This gives you control and comfort in a repeatable process that you know is up to date and supporting your application as it changes. DeployBot is still the easiest way to get your deployments setup. You can be up and running in minutes. At the same time, with Build Tools, it’s is now a deployment playground. The level of complexity (or simplicity) is entirely up to you. We hope you’ll give it a try and see what the system is capable of for your deployments. So, say Hi to DeployBot. In no time you’ll be wondering why you ever used Capistrano or manual scripts in the first place.